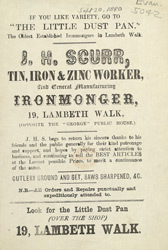 This is an advertisment for J. H. Scurr, owner of an Ironmongers store in Lambeth. The Ironmongers shop was the equivalent of a large department store today. Many useful items could be bought there from candles, saucepans and cleaning powders to knives, tools and building supplies. Often items would be purchased on credit and bills would be paid quarterly.